Zakynthos is an Ionian Island in Greece with wild landscapes, unspoilt coastlines and wonderful cosmopolitan towns. Enjoy the idyllic beauty of Greece both on board your superyacht and when you go ashore on a Zakynthos private yacht charter holiday. With its long sandy beaches, gorgeous countryside, the famous Shipwreck Beach along with stunning architecture, Zakynthos has everything and more you could possibly wish for. Go here for the full Greece yacht charter guide. If your yacht charter party is torn between an itinerary filled with cultural sites and exhibitions or a beach-side holiday having fun using all the water toys, Zakynthos is the perfect location to satisfy everyone's desires: Turtles swim in turquoise waters and nest on the beaches, and snorkellers and scuba divers can get up close to eagle rays, octopus, scorpionfish, reef sharks and lobster. Zakynthos has arguably the most famous beached wreck in all of the Mediterranean at Navagio Beach, and once the tourists have vanished for the evening you can have this setting all to yourself. In town, the Giatras Museum-Dionysios Art Gallery is a gem of a find, providing the local history in a three-hundred year old building that still has the old olive press. The gold-gilded Virgin Mary Faneromeni Church is a breath-taking labour of love, while picturesque Anafonitria Monastery has a garden just as beautiful as its interior where guests can rest. As mentioned, the island is a great place for snorkelling, diving, shopping, dining and awesome nightlife. It’s known as Zante, Zacinto or Zakinthos and is the southernmost island in this zone. The north-western part of the island has barren mountain peaks while the centre of the island is verdant with blossoms that gave it the name Flower of the East or “Fioro di Levante”. When the Venetians ruled Zakynthos, they created the charming architecture of the Byzantine buildings, museums and traditional piazzas like the one in Solomos Square. In the south of the island there’s a Mediterranean party atmosphere, luxury resorts and beautiful beaches of white sand. From Easter until the end of October this hot spot is a favourite with visitors as well as superyachts. You can still find a quiet spot on the beach or in a secluded cove. 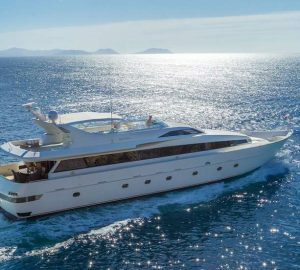 The Vasilikos peninsula has some gorgeous countryside, seaside towns and beaches while the city of Yerakas, only accessible by water, is also very popular luxury yacht charter spot. 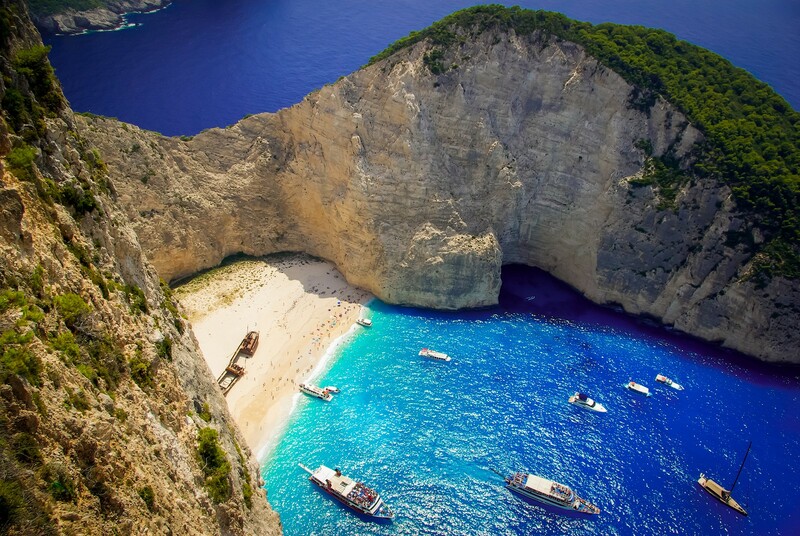 While in Zakynthos do visit the Shipwreck Cove or Navagio Beach. The ice-white sand on this beach is surrounded by limestone cliffs and azure blue waters. 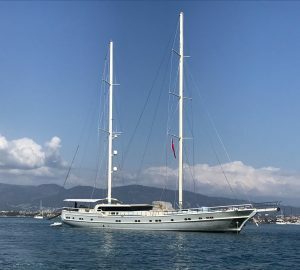 It’s a good idea to anchor your crwed luxury yacht here in the morning or late in the afternoon as it does get rather busy with other visitors. The protected area of Laganas Bay on the island is a breeding site for the endangered Loggerhead Sea Turtles. You might see a hatchling taking its first steps into the sea however, stand at a good distance just in case you frighten them. 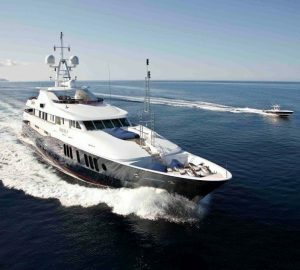 There is a good selection of sailing and motor charter yachts available in the summer season. See the Greece guide for further information on seasons, climate, itineraries and more in depth information.